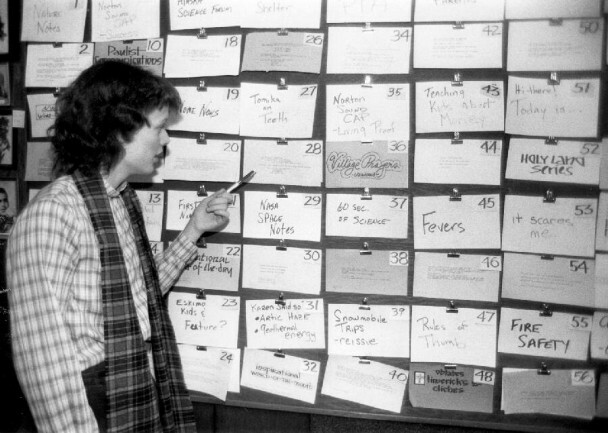 Those working on the radio mission – still an idea at this point, for a radio station without a name – write and mail the very first issue of the Nome Static, Transmission One, to potential donors. The mission’s first volunteer contributes her income – from her work as a kitchen worker at a Nome “greasy spoon” – to purchase broadcast equipment. In the early years, much of KNOM’s income came from registered nurses at the Nome hospital; they lived as volunteers and donated their income to the radio mission. 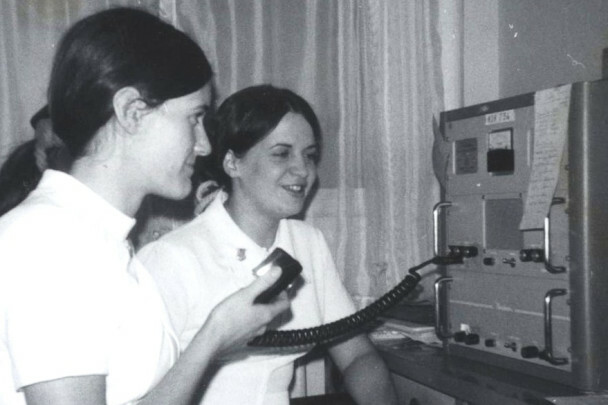 Here, two nurses – Candy Gleason (with the microphone) and Meg Gabriel – use a shortwave radio to give medical advice to a Western Alaskan village. 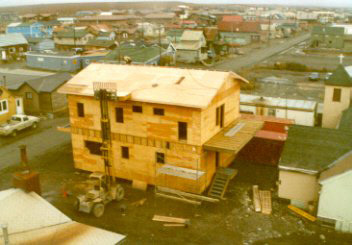 Volunteer work crews start to remodel buildings in Nome to house the radio station and its volunteers. The first volunteers make do with what’s available; the first residences include refurbished “KD” (knock-down) buildings originally built by the Army – as temporary structures – during World War II. Meanwhile, a construction crew erects and paints what will become KNOM’s first AM transmitter tower. On July 14th, KNOM makes its first official broadcast; Bishop Robert Whelan pushes the “play” button for the station’s first program. The brand-new station broadcasts the very first hourly newscasts in Alaska west of Anchorage. 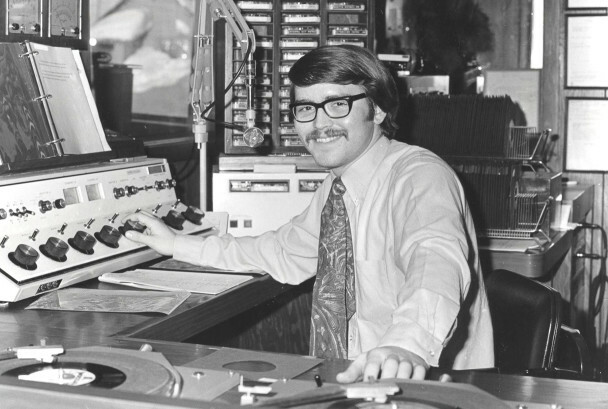 KNOM’s first DJs include Tom Busch, then a volunteer, who would become the station’s first permanent general manager in 1975. On its first Sunday on the air, the station broadcasts its first Catholic Mass, live from St. Joseph’s Church in Nome. 69 distinct power outages plague the station’s first full year of operation; one of them is 28 hours long. A young Tom Busch deejays in KNOM’s early days. 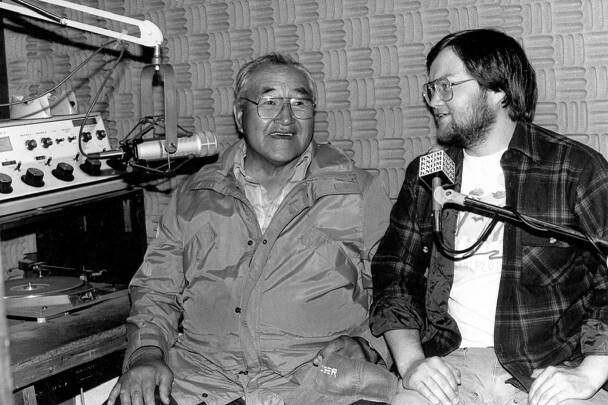 Tom founded KNOM Radio and worked tirelessly for the mission for four decades. KNOM covers the very first Iditarod Sled-Dog Race: in part, using retired, 1950s-era taxicab radios. Volunteers Les Brown and Roy Wells fly to the village of Wales to cover an unusual event: a California man attempts to cross the Bering Strait in a bathtub, carrying 1,000 letters of friendship for the Soviet Union. The broadcasts are successful; the bathtub crossing is not. An exceptional storm sends ocean waves crashing over Nome’s buildings, flooding downtown and crippling the town’s communications with the outside world. One of Nome’s few means of keeping in touch over the coming days is the keyboard of KNOM’s teletype machine, otherwise reserved for receiving news stories from the Associated Press. KNOM News Director Steve Havilland, although a hunt-and-peck typist, keeps Nome residents in touch with family members living elsewhere. Winter hits Nome early, setting low temperature records for November. The cold weather bottoms out at 40° below in December. KNOM broadcasts coverage of both national political conventions, gavel-to-gavel, through a feed from the Mutual Radio Network. The station is the only source of this information for many of its listeners. An archaeologist drops by KNOM to thank the station for the previous year’s convention broadcasts (above), which he’d heard with a small portable radio some 1,000 miles west of Nome, deep within the Soviet Union. To celebrate KNOM’s 7th birthday, volunteer Mark Hoelsken takes a special boat trip with Dean Pushruk, a member of the King Island Native Community. They travel in an umiaq (or traditional Alaska Native skin boat) to Sledge Island, an uninhabited island 20 miles west of Nome. Using an automobile battery to power a remote broadcast transmitter, Mark deejays from the top of the island. At the same time, fellow volunteer Chris Robling broadcasts from the sky! He’s a passenger in a small plane circling Sledge Island; Chris and Mark wave to each other and chat over KNOM’s airwaves. Inspirational spots appear for the first time in our newsletter, The Nome Static. In 1983, then-volunteer Lynette Berger (now Lynette Schmidt) checks the plywood “spot board” in the manager’s office. Each card represents one of 64 spots that air in rotation. KNOM transitions from vinyl records (LPs and 45 RPMs) to audio tapes for its regular music broadcasts. Long distance swimmer Lynne Cox swims the frigid Bering Strait between Alaska and the Soviet Union. KNOM volunteer Claire Richardson is aboard one of the small support boats. 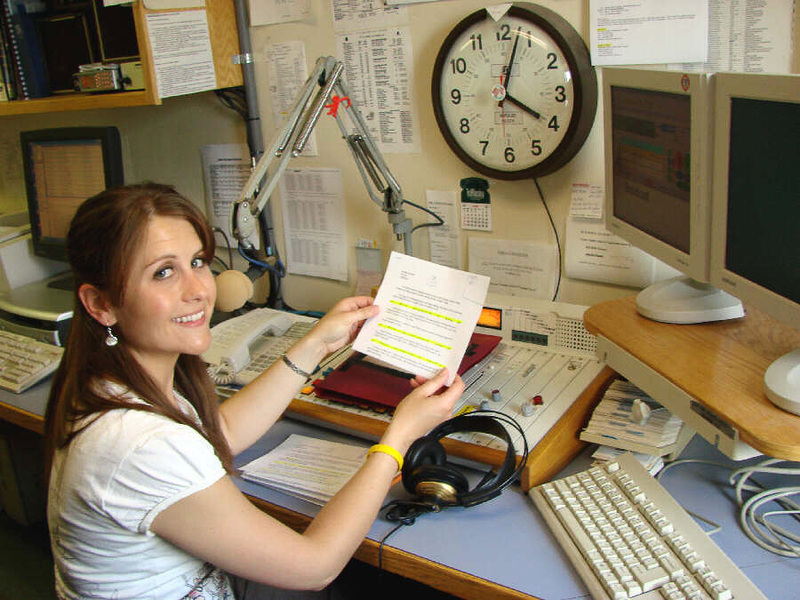 KNOM volunteer Claire Richardson is Alaska’s pool radio reporter on a precedent-setting trip to Provideniya, USSR in the Alaska Airlines 737 “Friendship Flight.” Her live reports are carried by over a dozen radio stations throughout the state. Nome hits an all-time low temperature of -54° F. The volunteers discover that if you toss a cup of boiling water into the air when the temperature is below minus fifty, the water disappears into a cloud of vapor. 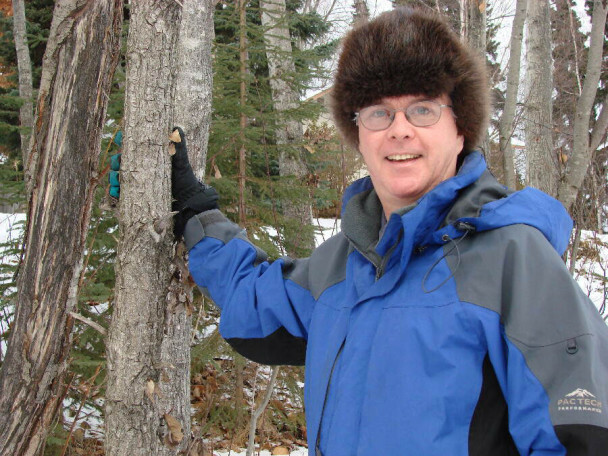 Elder Tim Gologergen and volunteer Sean Brennan co-host Radio Bridge to Siberia, a program with stories of interest to those living on both sides of the Bering Strait (in the United States and Russia). The show aired in both English and Siberian Yup’ik (YOO-pick). Photo circa late 1980s. The original Community House – a 50-year-old building originally intended to be “temporary” housing – is finally demolished. Construction begins on the new volunteer dormitory. A new 80-foot tower is also built to house KNOM’s microwave dishes. Construction begins on the new KNOM studio building. The station is honored to receive the Marconi Award for Religious Station of the Year from the National Association of Broadcasters. KNOM signs on from its new studios, now completed. For the first time, the station broadcasts in FM, as well as AM. 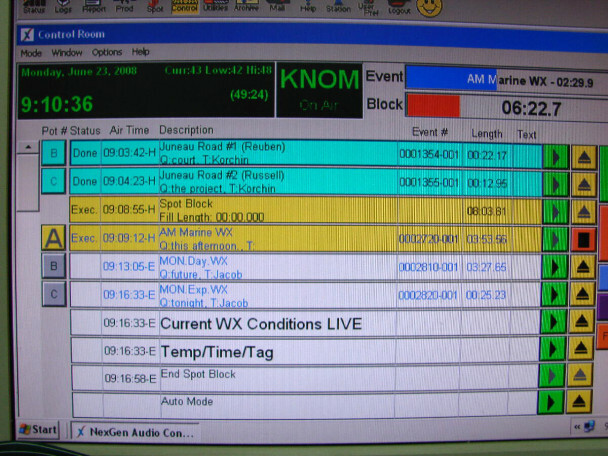 KNOM switches from analog tapes to a computer system for its broadcast audio. 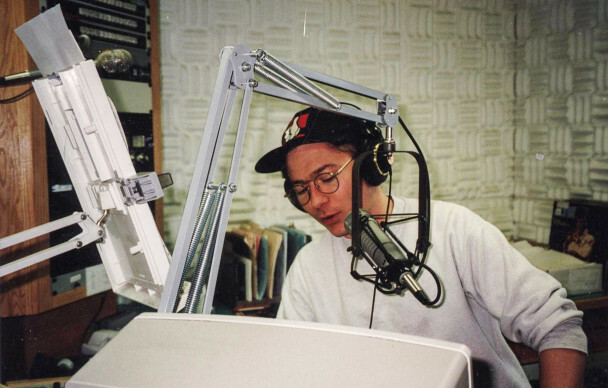 Volunteer Tom Bunger deejays at KNOM in the 1990s. 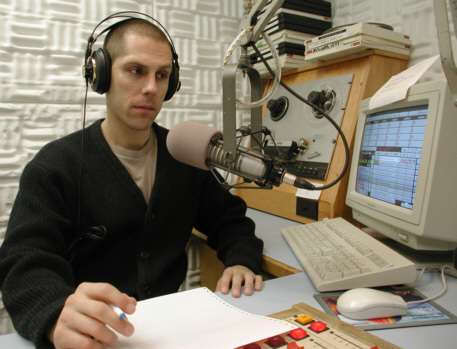 Tom eventually joined the permanent staff as the station’s news director. 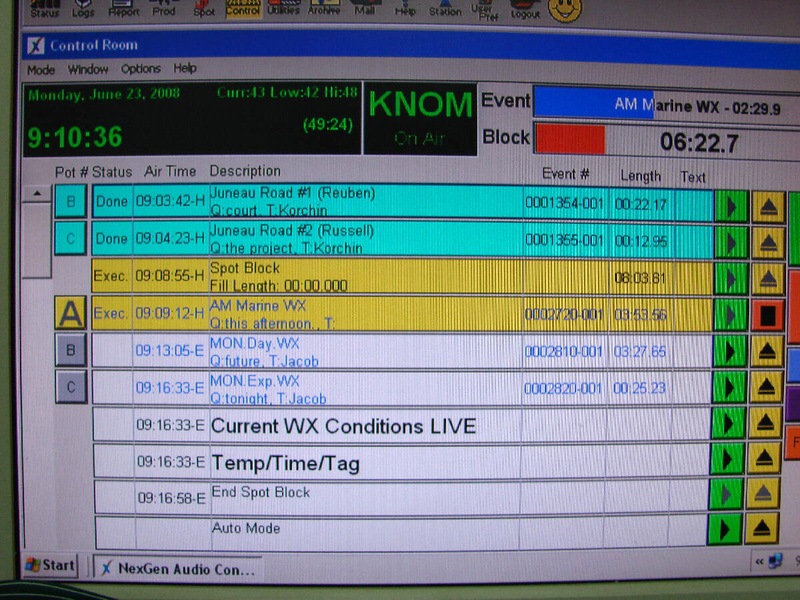 KNOM begins broadcasting 24 hours a day, 7 days a week, thanks to a major upgrade in the station’s computer system. 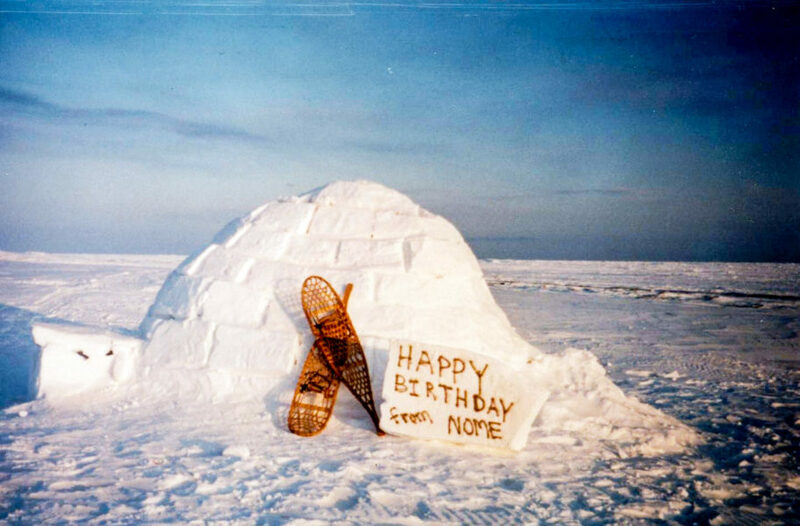 The station celebrates its 25th birthday (1971-1996); Nome Mayor John Handeland and Alaska Governor Tony Knowles proclaim “KNOM Day” to mark the occasion. Because of the eruption of Mount Pavlof – a volcano 600 miles south in the Alaska Peninsula – KNOM broadcasts volcanic ash advisories (in addition to blizzard warnings). KNOM goes online with the first iteration of this website:www.knom.org. The Nome Static – our newsletter – also goes online, with its first electronic issue. A Cessna Caravan with ten people aboard crashes three miles north of Nome in near-zero visibility. KNOM broadcasts frequent live reports from search and rescue headquarters and from the scene as rescuers battle heavy snow and fog looking for the aircraft. The passengers survived with minor injuries and were following the progress of their search using a portable radio tuned to KNOM. Immediately following the events of September 11th, KNOM broadcasts 61 straight hours of national news coverage from the Associated Press on the terrorist attack’s aftermath. For many listeners – including Americans stranded in Russia because of the temporary halt to all flight traffic – KNOM is the only source of news during this time. News Director Paul Korchin hosts a special two-hour-long edition of our Sounding Board call-in show in September 2001, just days after the terrorist attacks in New York and Washington, D.C. The show allowed Western Alaskans to share their thoughts, concerns, and support in the wake of the tragedy. KNOM airs its one-millionth inspirational spot. It’s a red-letter year for awards at KNOM. The National Association of Broadcasters honors the station with a Crystal Award (for Excellence in Community Service) and a Marconi Award (for Religious Station of the Year). 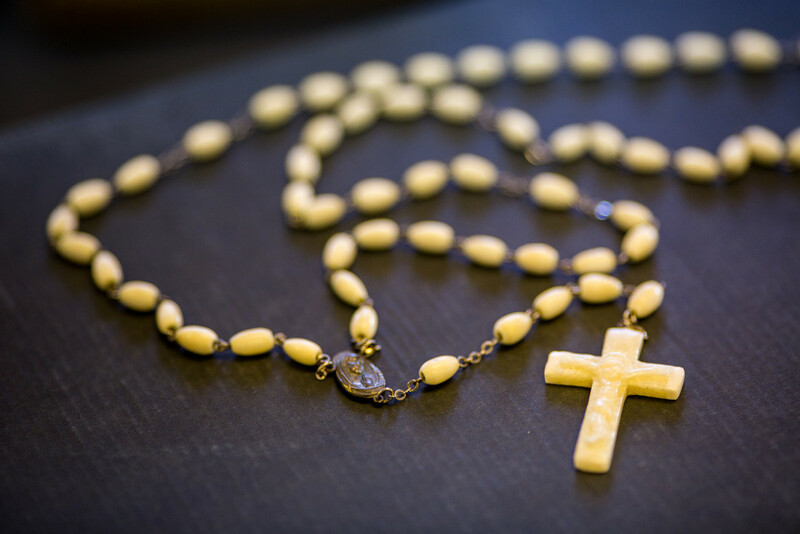 The Catholic Academy for Communication Arts Professionals gives KNOM its eleventh Gabriel for Radio Station of the Year, and the Alaska Broadcasters Association names KNOM the Alaska Community Station of Year. 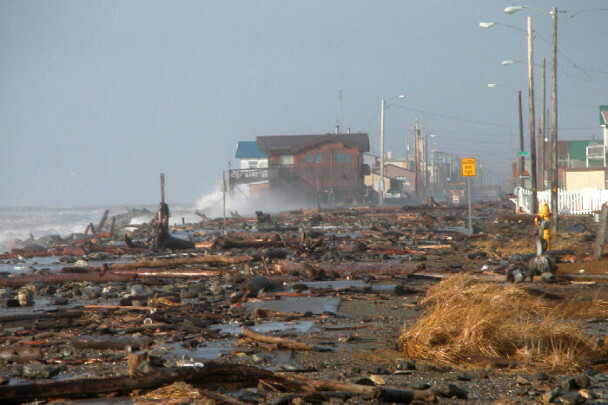 The aftermath of the infamous storm that ravaged Nome and environs in October 2004. Here is the east end of Nome’s Front Street just after the storm had passed, littered with driftwood and large rocks. KNOM provided live coverage and emergency advisories throughout the event. Volunteer newsie Jesse Zink revives Juneau Journal, a weekly program that highlights proceedings and news from the Alaska Legislature (in Juneau, Alaska’s capital city). A radio hobbyist in Sherwood, Oregon is the first person in KNOM’s 35-year history to hear the station from the Lower 48. Public Affairs Director Amy Flaherty in KNOM’s newsroom. Amy’s tenure at KNOM lasted six years, from 2002 to 2008. In 2007 (the year this photo was taken) her travels for KNOM News took her all over: from Fairbanks, Bethel and Barrow (all in Alaska) to Anadyr, Russia. In mid-June, dense fog shuts down the Nome airport for over seven days; 28 consecutive flights from Anchorage are unable to land. Nome goes without regular shipments of groceries or mail, and many travelers – including a few KNOM staffers – are stranded either in Anchorage or in Nome. The master computer control panel for KNOM Radio. A system-wide computer crash in June 2008 forced a complete computer upgrade and briefly suspended overnight broadcasts. Mount Redoubt erupts violently, throwing corrosive ash as high as twelve miles into the atmosphere. Alaskan air travel virtually stops, cutting off western Alaska from the outside world. On one occasion, a flight that leaves Nome is unable to return to Anchorage and winds up stranded at Barrow, on the northernmost coast of Alaska, until the ash settles. KNOM launches its Twitter account and (re-)launches its Facebook page; daily tweets and status updates keep KNOM fans informed on what’s happening at the station. Public Affairs Director Laureli Kinneen produces a very popular edition of Profiles on the subject of Sailor Boy Pilot Bread, a hard-tack-like cracker that’s a very common food in Western Alaskan villages (but barely consumed, available, or known outside the state). Later in the year, Laureli becomes the station’s News Director after the departure of longtime News Director Paul Korchin. A circa-2010 screenshot of KNOM’s profile on Twitter (@knom). Our Twitter account went live in 2009, with daily updates on goings-on at the station. For the very first time, KNOM covers the Iditarod Sled-Dog Race online. Iditarod fans read race news from KNOM and listen to interviews from the trail at knomonthetrail.org; the site also “live-blogs” the minute-by-minute happenings of the Nome-Golovin Snowmachine Race. During the month of March, the site gets thousands of “hits” (visits). The station formalizes plans to separate itself from the Catholic Diocese of Fairbanks, which had, to this point, owned KNOM Radio as one of its assets. KNOM announces the creation of KNOM Radio Mission, Inc.: a 501(c)3 non-profit corporation established to continue the broadcast traditions of KNOM Radio within a fully-independent, self-supported organization. 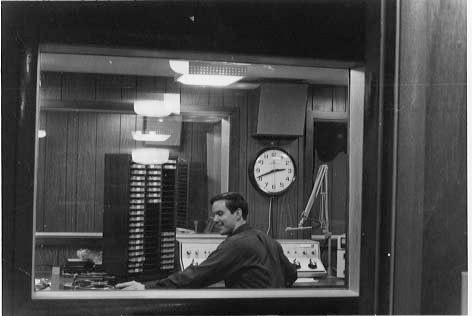 In November, KNOM Radio faces the staggering loss of its founder and dear friend, Tom Busch (photo below). Friends, family, and a large number of KNOM volunteer alumni gather in Anchorage for Tom’s funeral and in Nome for a memorial Mass, which is broadcast, live, on KNOM (see photos from the Mass and from the Busch family’s visit to Nome). Well-wishers send remembrances of Tom, which are posted on our website. Tom Busch, the founder of KNOM Radio and a dear friend. Tom passed away on November 1, 2010. KNOM launches a brand-new, fully-redesigned-from-the-ground-up website at www.knom.org. Among many other new features, the site offers regular recordings of Update News, new information about the station’s staff, mission, and history (above! ), easy ways of sending hotlines, music requests, and community announcements, and an all-new design.